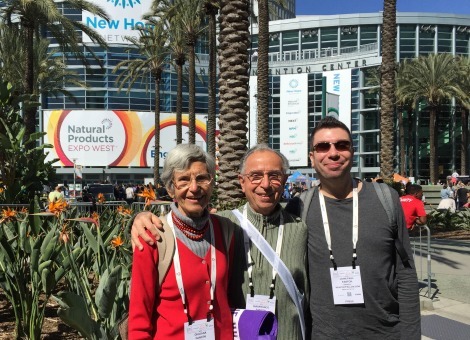 Since many of my clients and readers can’t attend ExpoWest, I’m going to devote several blogs to some of the more interesting and useful information Team Healthy Fellow discovered there. Today’s column presents a selection of genuinely healthy and novel foods I think you should know about. Chips are generally frowned upon by health conscious consumers because they’re typically made from corn or potatoes and deep fried. This new offering from Rhythm Superfoods provides a true alternative for those who are looking for a healthier crunch. These non-GMO beet chips possess the same health benefits of beet juice, but in a less refined form. A recent review in the journal Nutrients mentions a long list of “clinical pathologies” that beetroot may ameliorate because of its ability to increase nitric oxide, quell inflammation and reduce oxidative stress. Beet chips are not only rich in antioxidants, they’re also an excellent source of dietary fiber and potassium. And, while they are super crispy, they’re not fried! Instead, they’re carefully dehydrated to preserve the maximum amount of nutrition. What’s more, a study published in 2014 reported that select phytochemicals in beets may actually lower post-meal blood sugar and insulin concentrations. So, diabetics and those on low-carb diets don’t necessarily need to rule these out. If you are so inclined, try a small serving and test to see how it affects your personal glucose response. To be honest, I probably would not have tried this product if samples weren’t given out on the show floor. They just look a little too “hippy healthy” to be delicious. Plus, I’ve tried more than my share of disappointing bread substitutes. But, I stand corrected! WrawPs is a line of vegetable-based wraps. They’re gluten-free, organic and raw. My favorite is the Veggie Life flavor. It boasts a commendable, nutrient dense ingredient list: Organic Lettuce, Organic Spinach, Organic Flax, Organic Coconut, Organic Turmeric and Black Salt. You can cut the 7.5”x11” wraps into smaller pieces to serve as hors d’ oeuvres – a topping idea is coming up. Or, you can use this veggie-packed, bread alternative as a pizza crust or sandwich wrapper. Besides their enjoyable flavor, keep in mind that eating more of the vegetables featured in the full line of WrawPs, such as cabbage, coconut and spinach, benefits your body in countless ways including: a) lowering the risk of fibroids; b) improving ocular antioxidant status; and c) supporting cognitive function in those with dementia. This was a real revelation for me. 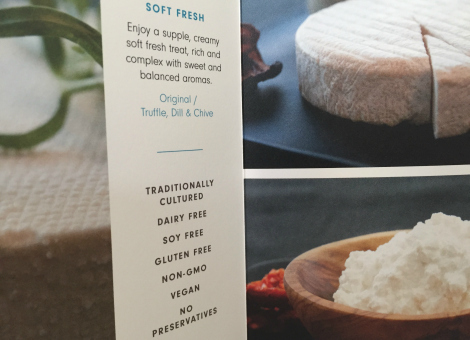 Kite Hill is a relatively new company that makes a line of cheeses and yogurts from pure almond milk. This offers an inviting alternative to those who are sensitive to dairy and common dairy substitutes, such as soy. Of course, even the best concepts still require the taste to be spot on. In this case, they’ve hit the bullseye! I suspect the reason is that, first and foremost, the crew of chefs and scientists involved wanted their invention to compare favorably to any delicious, milk based cheese. Why go out of your way to eat more almonds? The data on tree nut consumption and health is quite strong. Year after year, more studies emerge showing a powerful association between nut intake and decreased mortality risk. This is especially true when it comes to the greatest health threat of our time: cardiovascular disease. But, beyond that, real almond milk is more nutrient dense than other dairy alternatives – hemp, rice, soy, etc. By “real” I mean that this isn’t the typical almond milk you see in health food stores and supermarket shelves. Kite Hill doesn’t strip their milk of its natural fat while including additives and flavors like most conventional products. For instance, their soft ripened cheese only contains: almond milk (water, almonds), salt, enzymes and cultures. Clean and simple. You may have noticed that the three products I featured today are all vegan-friendly. That wasn’t by design nor a philosophical shift in my nutritional outlook. However, whether you’re vegan or not, I think most people would do well to include more nuts, seeds and vegetables in their daily diets. Doing so has been shown to minimize all-cause mortality, cancer incidence and it may even protect against age-related muscle loss or sarcopenia. So, why not enjoy some beet chips instead of potato crisps? Make your next tuna fish sandwich in a WrawP, and have some almond cheese with an organic apple or a glass of biodynamic red wine. Healthy food can indeed taste great. Enjoy! Appl Physiol Nutr Metab. 2016 Apr;41(4):421-9. 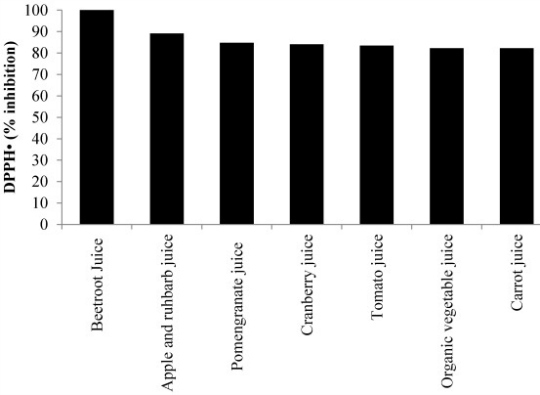 Is beetroot juice more effective than sodium nitrate? The effects of equimolar nitrate dosages of nitrate-rich beetroot juice and sodium nitrate on oxygen consumption during exercise. Dietary nitrate has been reported to lower oxygen consumption in moderate- and severe-intensity exercise. To date, it is unproven that sodium nitrate (NaNO3(-); NIT) and nitrate-rich beetroot juice (BR) have the same effects on oxygen consumption, blood pressure, and plasma nitrate and nitrite concentrations or not. The aim of this study was to compare the effects of different dosages of NIT and BR on oxygen consumption in male athletes. Twelve healthy, well-trained men (median [minimum; maximum]; peak oxygen consumption: 59.4 mL·min(-1)·kg(-1) [40.5; 67.0]) performed 7 trials on different days, ingesting different nitrate dosages and placebo (PLC). Dosages were 3, 6, and 12 mmol nitrate as concentrated BR or NIT dissolved in plain water. Plasma nitrate and nitrite concentrations were measured before, 3 h after ingestion, and postexercise. Participants cycled for 5 min at moderate intensity and further 8 min at severe intensity. End-exercise oxygen consumption at moderate intensity was not significantly different between the 7 trials (p = 0.08). At severe-intensity exercise, end-exercise oxygen consumption was ∼4% lower in the 6-mmol BR trial compared with the 6-mmol NIT (p = 0.003) trial as well as compared with PLC (p = 0.010). Plasma nitrite and nitrate concentrations were significantly increased after the ingestion of BR and NIT with the highest concentrations in the 12-mmol trials. Plasma nitrite concentration between NIT and BR did not significantly differ in the 6-mmol (p = 0.27) and in the 12-mmol (p = 0.75) trials. In conclusion, BR might reduce oxygen consumption to a greater extent compared with NIT. Recent Pat Food Nutr Agric. 2016 Mar 21. BACKGROUND: Flaxseed is becoming an increasingly widely used food ingredient. The rising interest of the food industry in this nutraceutical is primarily because of functional nutrients, such as alpha-linolenic acid and lignans, which have health benefits due to their lipid-lowering properties. OBJECTIVE: The objective of this study was to provide an overview of the patenting of flaxseed products with cholesterol-lowering effects. METHOD: Patent applications filed by country of origin were retrieved from the Derwent Innovations Index® database. RESULTS: A total of 307 patent documents were identified, of which 184 claim the use of flaxseed or parts of the flax plant in the product formulation, for their lipid-lowering effect when consumed by humans. A few of the patent applications contain claims for new products based on flaxseed in isolation, including the preparation of foods designed to inhibit the production of cholesterol. Most of the claims were for flaxseed in the form of oil and in association with other lipid-lowering compounds, mainly for the food industry, in the form of dietary supplements or baked products designed to raise their high-density lipoprotein content, and for treating heart problems. China and the United States are the leading countries of flax-related applications. CONCLUSION: These results may have important implications for the production of functional food products that meet specific societal demands. J Sci Food Agric. 2016 Mar;96(5):1836-43. In vitro and in vivo evaluation of the prebiotic effect of raw and roasted almonds (Prunus amygdalus). BACKGROUND: Almonds contain considerable amounts of potential prebiotic components, and the roasting process may alter these components. The aim of this study was to compare the in vitro fermentation properties and in vivo prebiotic effect of raw and roasted almonds. RESULTS: In vitro, predigested raw and roasted almonds promoted the growth of Lactobacillus acidophilus (La-14) and Bifidobacterium breve (JCM 1192), and no significant differences were found between these two nuts. In a 4-week animal trial, daily intake of raw or roasted almonds promoted the population of Bifidobacterium spp. and Lactobacillus spp. and inhibited the growth of Enterococcus spp. in faeces and caecal contains of rats. Compared with roasted almonds, raw almonds had a greater bifidobacteria promotion effect. Besides, significantly higher β-galactosidase activity and lower β-glucuronidase and azoreductase activities in faeces or caecal contents of rats were observed with raw almonds than with roasted almonds. While, in terms of metabolic effects, the ingestion of roasted almonds resulted in significantly greater intestinal lipase activities. CONCLUSION: Both raw and roasted almonds exhibit potential prebiotic effects, including regulation of intestinal bacteria and improved metabolic activities. The roasting process may slightly reduce the prebiotic effects of almonds but significantly improve the metabolic effects. Thank you for your finding the jewels of healthy foods presented at the Natural Products Expo, making it possible for us to try those most valuable based on your expert recommendation! To me the eye opening benefits of beets specially in their freeze dehydrated chips form are very attractive! The additional comment about the benefit of consuming raw almonds rather than roasted to maximize the prebiotic results of their digestion proved very useful to me. It will influence my choice of raw almonds butter too!l Those WrawPs made of veggies are surprisingly helping with vision, cognition and fibrosis prevention! Thank you for your valuable assessments! I am looking forward to read your Part 2! Keep up your great work! It is helping me and many of my octogenarian friends! Part two should be up later this week. And, I plan a total of five column total. So, please stay tuned! I hope you’ll benefit from the upcoming blogs as much (or more) than this one!